Idea Lab of the University of Tartu provides pre-incubation programme for all students. Our extra-curricular entrepreneurial programme enables students to develop ideas to validated business models. Our workshops are integrated with hands-on exercises and team mentoring sessions. Mentors are start-up founders or entrepreneurs from different business sectors. It is a place where students from all disciplines can find innovative solutions to everyday problems and test viability of their ideas. Idea Lab is perfect for students who are passionate about turning ideas into reality. 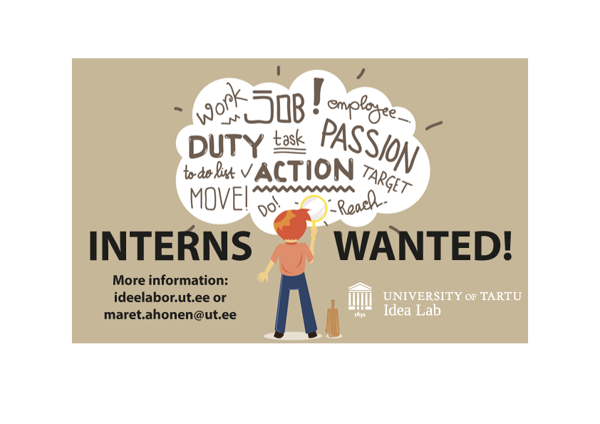 To apply send your resumé and motivation letter to maret.ahonen@ut.ee. Application deadline: 18.04.2016. Check our homepage for more information about Idea Lab: ideelabor.ut.ee. If you have questions feel free to send an e-mail to the given address or visit Idea Lab.